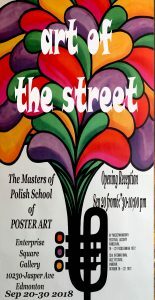 To Present POLISH CULTURAL HERITAGE Within Canadian Content. 2018 Festival Focuses on Polish Music & Visual Arts. 1.Polish Poster Masters’ Exhibition from 20 to 30 September 2018 at the Enterprise Square Gallery at 10230-Jasper Ave. (the same place where the Hudson Bay Company store in downtown Edmonton) The opening will take place on September 20 from 6:30 am till 10 in the evening. You’re welcome. 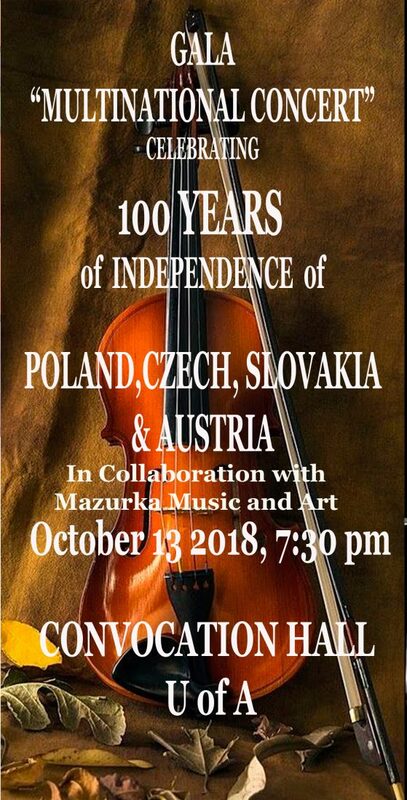 2.On the 13th of October at 19:30 there will be a Great Gala at the Convocation Hall of the University of Alberta, a multinational Concert for the 100th anniversary of independence of Poland, the Czech Republic, Slovakia and Austria. 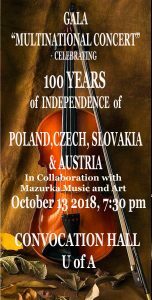 The concert will feature Polish classics such as Janusz Wawrowski, violinist from Poland, Mikolaj Warszynski piano, Zuzana Simurdowa Piano, Bogumil Dzielo- Wawrowski vocal and many other local musicians from the Symphonic Symphony. Gala organized by the Wirth Institute in cooperation with KPK, TKP and Mazurka Music and Art. October 13, 19:30 Convocation Hall. We invite you. 3.On October 25 TKP will host the world-famous string quartet Atom String Quartet from Poland, which is one of the few in the world of bands performing jazz music for strings. Guest pianist Andy Sandecki will perform with the quartet. Atom String Quartet visited Edmonton a few years ago with great success. The concert will take place at the Polish Hall on October 25 at 19:30. Tickets $20 adults, $10 students and seniors to be purchased at Tix On The Square and at the entrance on the day of the Concert, and members of the TKP with an valid membership admission free. 4.On November 1 this year, traditional Jazz All Souls will be held. At the invitation of the TKP in Edmonton from Poland, the trio Adam Czerwinski arrives. The band will present their latest album released this year and devoted mostly to Polish composers like Tadeusz Nalepa from Breakout and Czeslaw Niemen performing their compositions in a jazz version for two guitars and drums. We will also hear Skaldowie compositions. 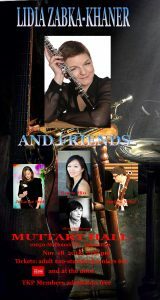 Jazz All Souls will be held on November 1 in the Lower Hall of the Polish Hall, beginning at 19:30. Tickets are $20 adults, $10 students and seniors are available at Tix On The Square and at the entrance on the day of the Concert. Members of TKP free admission. 5.On November 18 at Muttart Hall, TKP will present the Polish oboe’st of the Edmonton Symphony Orchestra Lidia Zabka Khaner with her musical friends: Julian Scot clarinet, Sara HO piano, Mathew Nickel bassoon and Allene Hackleman Hornet. The beginning of the concert at 19:00 and Tickets in the price of $20 adults, $10 students and seniors to be purchased at Tix On The Square and at the entrance on the day of the Concert. Members of TKP free admission. 6. On December 1st, TKP in Edmonton invites you to the next “Paint Night” with dr. Izabella Orzelski Konikowski. This time, under the supervision of Izabella, the participants of the painting afternoon will paint the Water Lilies according to the French painter Claude Monet. As usual, the paint night will take place in the lower level of of the Polish House, beginning at 13:00. the cost of a person will be 10 dollars and important members of the Cultural Entity, of course, free. All plastic materials and refreshment are provided by TKP. The number of places is limited, so please register at 780 2892879 by the end of October. We also invite your Canadian friends because this time classes will be conducted in English. I would like to book three seats for the Paint Night with Dr.Orzelski on December 1, 2018.